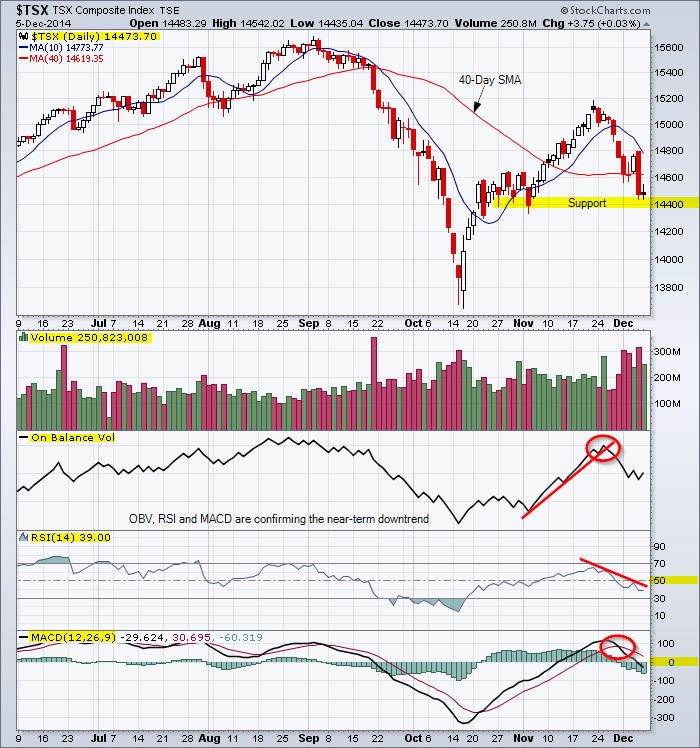 This entry was posted in TSX Index and tagged candlestick chart, MACD, OBV, RSI, TSX on December 5, 2014 by Trader. 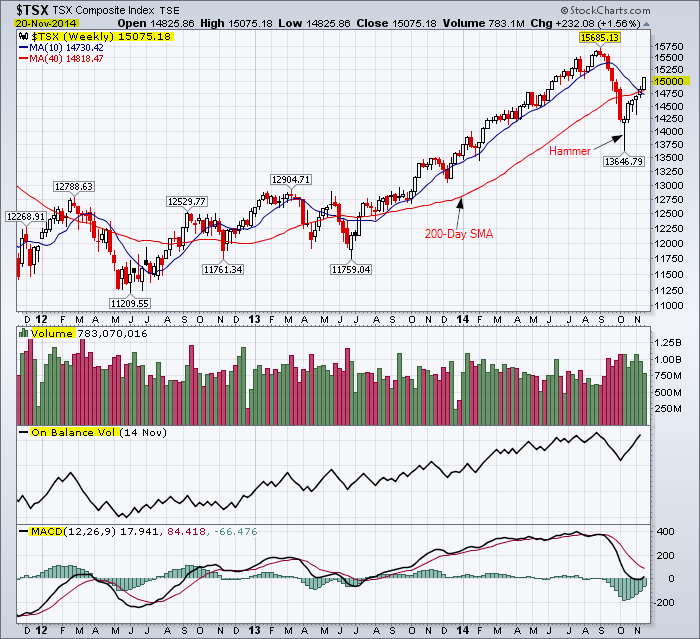 Can the TSX Index hold above major resistance of 15000? 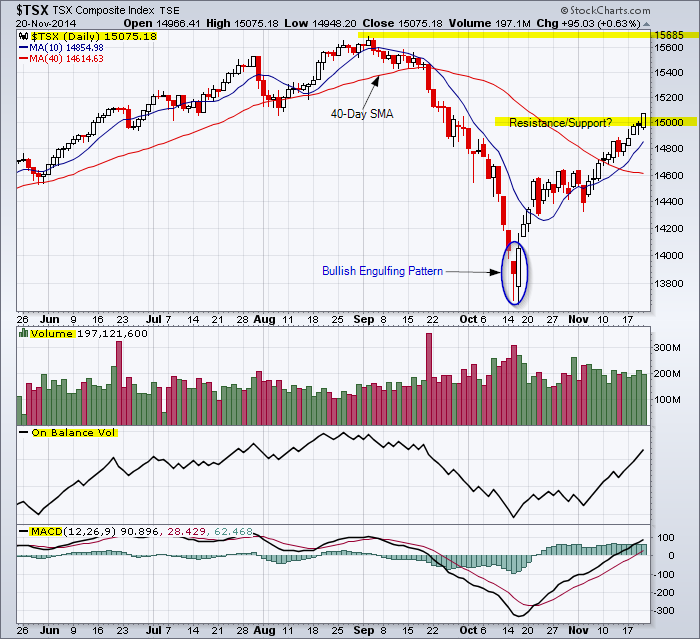 Reference the candlestick chart published on October 16 showing the hammer on the weekly chart and the bullish engulfing pattern on the daily chart which indicated the bottom for the TSX Index. This entry was posted in TSX Index and tagged MACD, OBV, resistance, support, trend, TSX, volume on November 20, 2014 by Trader. Reaction to the ECB rate cut! Acting in a more sweeping fashion than most investors anticipated, the European Central Bank yesterday cut interest rates to unprecedented lows ………………….. 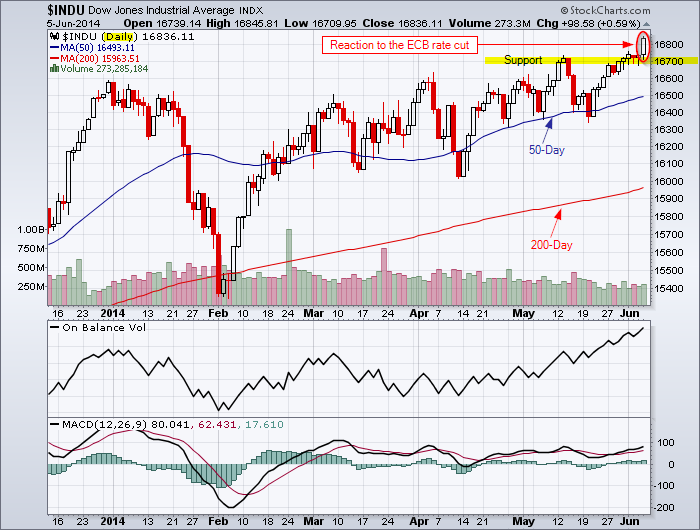 This entry was posted in U.S. Indexes and tagged candlestick chart, chart, DJIA, OBV on June 5, 2014 by Trader. Reference the last chart analysis for the Canadian oil sector. Reference the sector analysis for the TSX Index. Reference the fundamentals for Encana. This entry was posted in Stocks and tagged chart, Encana, MACD, OBV on April 8, 2014 by Trader. With a 41% gain from the July low and concerns over the top line growth, you would expect profit taking at the $11.00 resistance level. Fourth quarter 2013 revenue was $5.6 billion, compared with $5.8 billion sequentially, and $5.9 billion in fourth quarter 2012, as realized aluminum prices declined 1 percent sequentially, and 7 percent year-over-year. Revenue in 2013 was $23.0 billion, compared to $23.7 billion in 2012 as realized aluminum prices declined 4 percent year-over-year. In 2014, Alcoa projects global growth in the aerospace (7 percent to 8 percent), automotive (1 percent to 4 percent), packaging (2 percent to 3 percent), and building and construction (4 percent to 6 percent) markets. After a strong 2013, Alcoa projects a steady commercial transportation market (-1 percent to 3 percent), and a decline in the industrial gas turbine market (-8 percent to -12 percent) on lower orders for new gas turbines and spare parts. Alcoa sees global aluminum demand growth of 7 percent in 2014, after 7 percent growth in 2013. This entry was posted in Stocks and tagged Alcoa, chart, logarithmic chart, OBV, resistance, RSI, support, volume on January 9, 2014 by Trader. PetroBakken Energy (PBN:TSX) candlestick chart analysis showing the morning doji star candlestick pattern. And a bullish white candlesticks gaps away from the previous white candlestick with a confirmed breakout at $17.00. 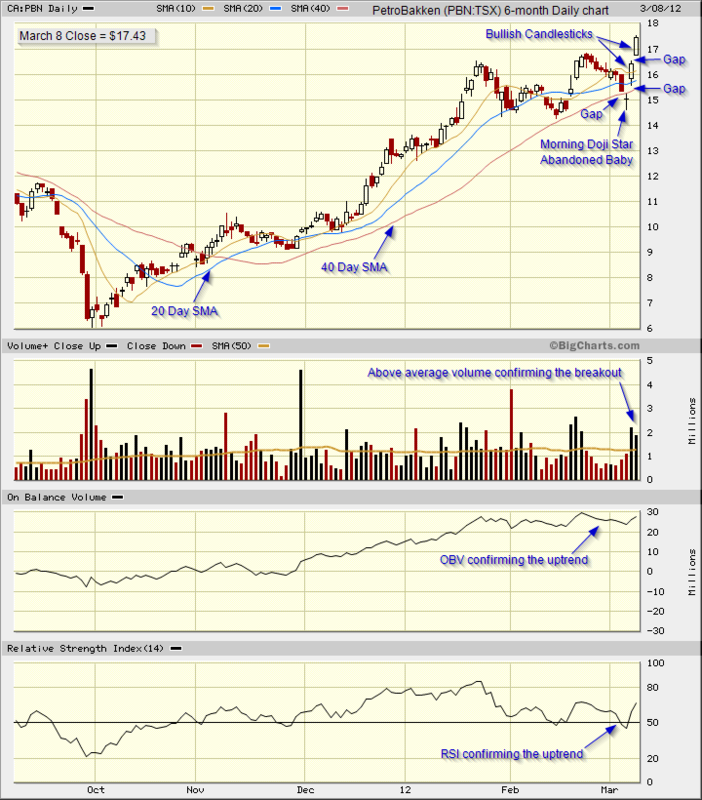 Volume, On Balance Volume (OBV) and the Relative Strength Indicator (RSI) are confirming the uptrend. The morning doji star is a major reversal pattern which called an end to the near-term downtrend that started on February 23. It is comprised of three candlesticks. The first candlestick is the dark tall bearish candlestick that appeared on March 5. The bears were in control at this stage but the volume was relatively light. Then on March 6, a gap appears with a doji (narrow or the same opening and closing) which is the second part of the pattern. Then on March 7, there is another gap and a tall white candlestick associated with above average volume. The reversal pattern is now completed. This particular morning star formation is rare and would be properly called an abandoned baby. It has two gaps where there is no overlap of the shadows. You must always be cognizant of the fundamental news for a company and the reaction on the chart. View the following release for the details: PetroBakken Energy Ltd. is pleased to announce our fourth quarter and year-end 2011 financial and operating results. This entry was posted in Stocks and tagged candlestick chart, morning star, OBV, RSI, TSX, volume on March 9, 2012 by Trader. The reversal of roles is an important concept in technical analysis: $55.00 was resistance and it is now the new support level. Review the RBC Royal Bank website for the fundamental data.. This entry was posted in Stocks and tagged candlestick chart, OBV, Royal Bank, volume on March 2, 2012 by Trader. Trading in a narrow congesting area also known as a trading range of $34-$35. The near-term trend is sideways. The intermediate trend is up. The probability favors the continuation of the intermediate uptrend. 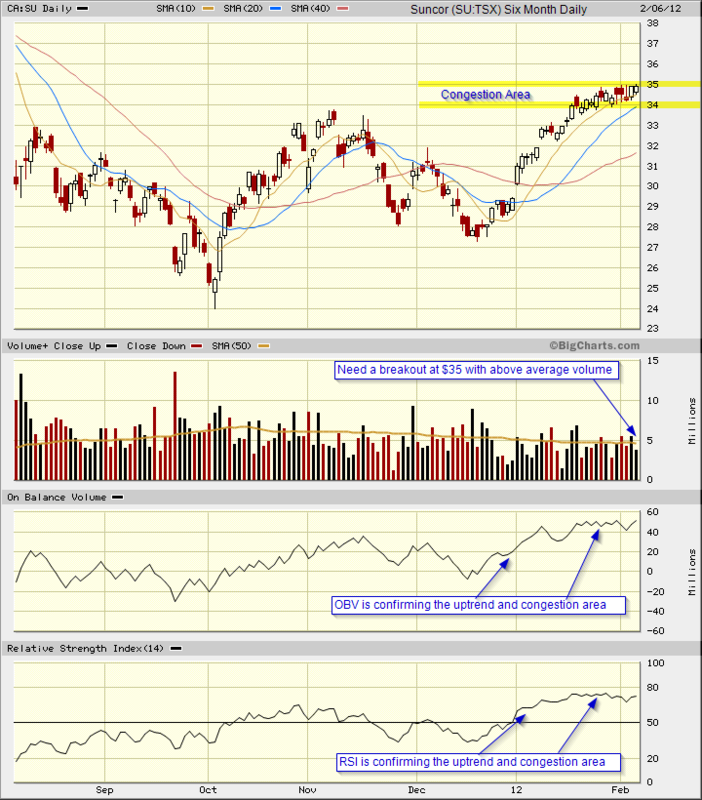 Volume, OBV and RSI are confirming indicators. 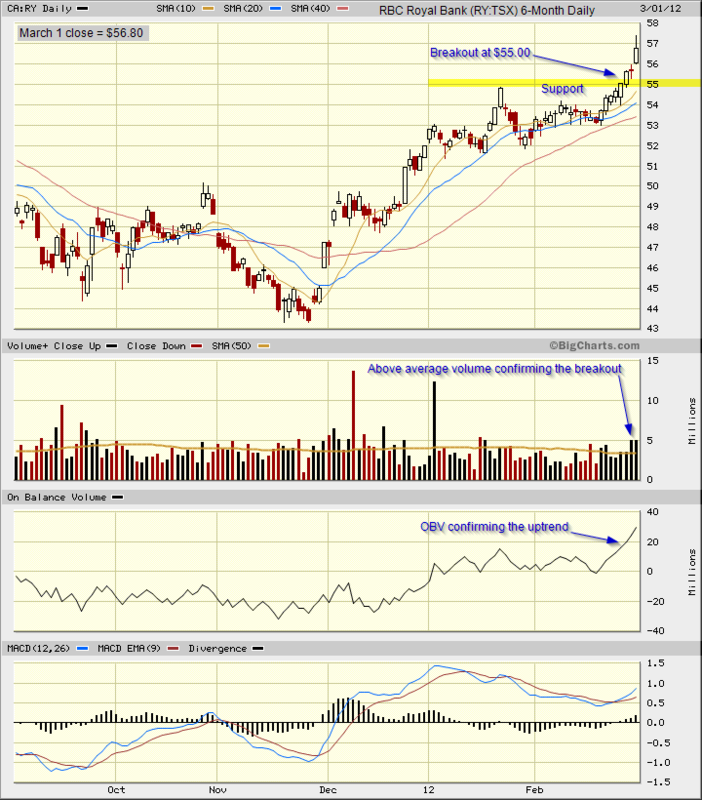 Look for increased volume and a breakout at $35 to add to long positions. A confirmed break below $34 would be reason to liquidate long positions. A time period to monitor for resolution of the congestion area is one to three months. Reference my March 10, 2011 post for Suncor: Is the sun still shining on Suncor? Reference the website for Suncor to review the fundamental data for the company. This entry was posted in Stocks and tagged candlestick chart, congestion area, OBV, RSI, Suncor on February 7, 2012 by Trader.